It is the science of pottery which may be defined as the objects made from thespecial type of clay, hydrated aluminum silicate (Al2O3.SiO2.2H2O), feldspar and silicates. The pure fine white clay made of feldspar is called Kaolin of China clay. It is used in ceramics. Some articles made by ceramics are coated with tin oxide or lead oxide and heated again. The coating forms a thin layer over the surface. This process is termed as glazing. Glazing makes the surface of ceramics smooth, attractive and waterproof. It can withstand high temperature. They are not affected by acid, alkali or other chemicals. They are poor conductor of heat and electricity. They are hard and brittle but attractive. Being poor conductor, they are used for making furnace of insulators in TV sets, electric fittings, etc. They are used for making artificial teeth, bone joints and porcelain. Ceramics is the science of pottery which may be defined as the objects made from the special type of clay, hydrated aluminum silicate (Al2O3.SiO2.2H2O), feldspar and silicates. The pure fine white clay made of feldspar is called Kaolin or China clay. The properties of ceramics are high temperature, poor conductor of heat and electricity, hard and brittle but attractive, etc. Ceramics is used to make furnace of insulators in TV sets, electric fitting, make artificial teeth, bone joint and procaine, make household pottery, jugs, tile, bowls, cups,sink, etc. 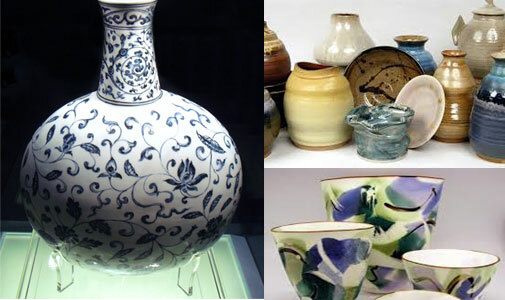 Ceramics is the special type of clay containing a compound of carbon, nitrogen, silica and oxygen. Why is ceramics utensils commonly used? The ceramics utensils are commonly used because they do not absorb water and not affected by acid, base, salt and high temperature. Write any two uses of ceramics. It can be used to make artificial teeth, bones etc. Porcelain is bad conductor so , it is used to make different kinds of electrical appliances. Why is glaze added in ceramics? When glaze is added in ceramics, the surface becomes smooth and attractive. Hence, it gives attractive look to the ceramics. Write down the two nature of ceramics. 1) It has attractive smooth surface, thus can be used to make decorative objects. 2) It disperses equal amount of heat all around its surface. Which fertilizers promotes fast growth and development of plants? Which one is not used to make ceramics? The molecular formula of hydrated aluminum silicate is ______. The coating forms a thin layer over the surface. This process is termed as ______. The substance which is not affected by acid, alkali or other chemicals is ______. Any Questions on 'Ceramics '?